According to President Rodrigo Duterte, he is ready to defend his post on the alleged plot to oust him and he will give them a good fight. 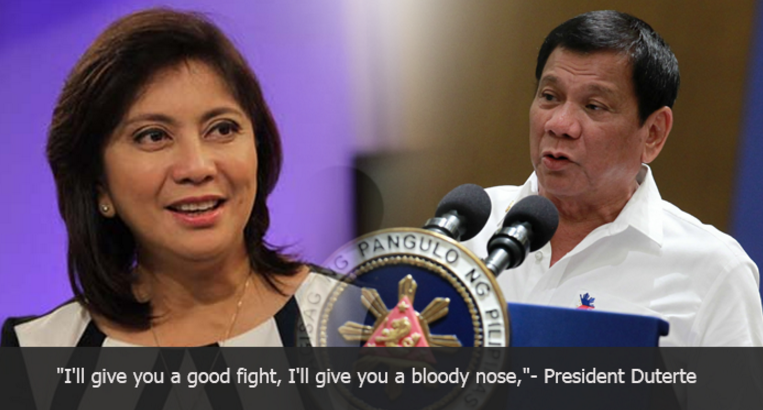 “I’ll give you a good fight, I’ll give you a bloody nose” President said. During his interview, the president also expressed his views and answered them truthfully. The interviewer asked Duterte if he give a new position to Robredo, but Duterte said he is not considering it because of the sour relationship with her. “Nandiyan kasi siya (sa rally) tapos bukas magharap kami don’t you think it’s a very incongruous thing?” the president said. “You are part of the crowd that says you want me out,” the president added. The plan of Liberal Party to oust Duterte was already denied by themselves, but conflict between them still arise.